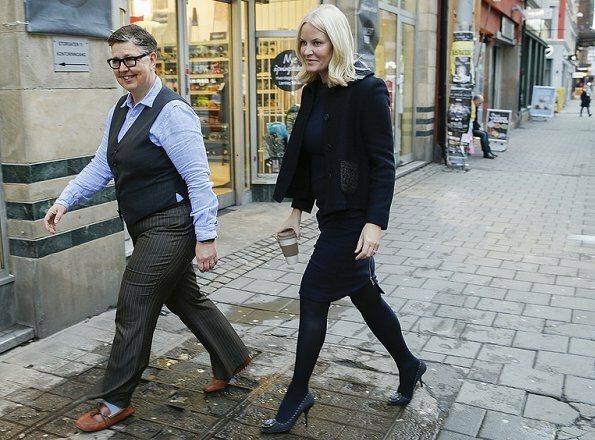 On January 12, 2017, Crown Princess Mette-Marit of Norway visited the Forum for Women and Development (FOKUS) in Brumunddal, Oslo, Norway. Princess Mette-Marit is the patron of Forum for Women and Development (FOKUS). She looks good although it's hard to see much detail. I won't mention the black tights as I like them - wore black tights today myself. Princess Mette looks good here,I think she lost some weight. Like her all outfit including tights minus paper coffee cup in hand. The jacket is a smart choice. It looks very nice on her. MM looks good, but it is difficult to see the outfit properly. I agree that the jacket is a smart choice, but I don't like the skirt with the zipper.